KUALA LUMPUR (July 25): Sime Darby Bhd’s 99%-owned subsidiary Weifang Sime Darby Port Co Ltd (WSD) has signed a memorandum of understanding (MoU) with Halal Industry Development Corporation (HDC) to develop Halal compliant infrastructure at Weifang Sime Darby Port and an industrial park in accordance with Malaysia’s Halal standards. HDC is an agency under Malaysia’s Ministry of International Trade and Industry (MITI). In a filing with Bursa Malaysia this afternoon, Sime Darby said the MoU was signed last Friday. WSD has businesses in the plantation, property, industrial equipment, motors and logistics sectors. Sime Darby said HDC will be working with both WSD in China and Sime Darby in Malaysia to further strengthen Malaysia’s leadership in the Halal industry, particularly in the Halal logistics services. It said the MoU was signed by HDC chief executive office Datuk Seri Jamil Bidin and WSD chairman Timothy Lee Chi Tim. The conglomerate said the collaboration will facilitate the penetration of Malaysian Halal products into the One Belt One Road (OBOR) network for wider market reach in Northern and Western regions of China, as well as in neighbouring countries. It added recent OBOR initiatives aim to create the world’s largest platform for economic cooperation, including policy alignment, trade promotion and financing collaboration, as well as for social and cultural exchange. 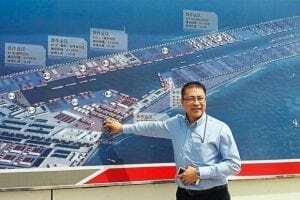 Sime Darby said Weifang Sime Darby Port’s close proximity to the OBOR network provides an added advantage to the “halal corridor” with links to Muslim regions in China, making Weifang Sime Darby Port the gateway for import and export of halal products. It said as part of the MOU, HDC will share its expertise and offer training and consultancy services to WSD. This joint effort is expected to benefit Malaysian exporters in expanding their halal businesses worldwide. Jamil Bidin said Malaysia’s Halal exports grew by 7.1% to RM42.18 billion in 2016, while total exports to China amounted to RM5.4 billion and was featured as the largest export markets in 2016. Jamil Bidin said Halal export is expected to grow 5% to 6% this year. Malaysia exports cosmetics & personal care, food & beverage, palm oil derivatives, pharmaceuticals, Halal ingredients and industrial chemicals to China. Sime Darby closed unchanged at RM9.55, with 2.33 million shares traded in the morning session today.